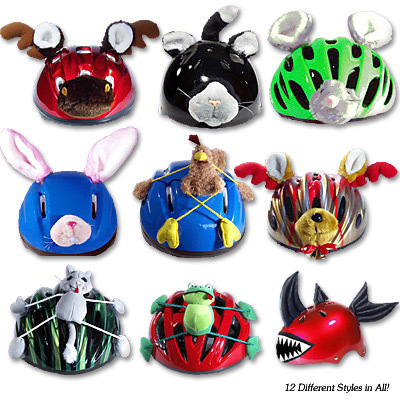 These helmet toppers are a great way to get kids to actually wear their helmets while they ride their bike. The bunny one is my favorite. What's yours? Damn! The Moose is sold out! The trick would be to figure out how to get them to use the chin strap. Kids usually wear their helmets, it's just that they do it in such a way that they are completely useless. Yet posters for bike helmet safety advise not to add decorations to helmets. I think those would be a great way to get your kid beaten up. Might as well add a "Kick me!" sign to the back. Awesome! Where do I buy them?